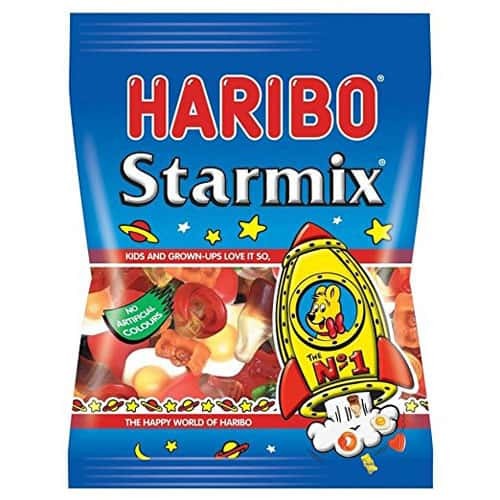 Haribo Fun Gums Starmix Sold: Single. Quantity: 9 gums in a bag approx. Weight: 16gr approx. Fruit and Cola flavour gums with sweet foam gums. Ingredients: Glucose Syrup, Sugar, Dextrose, Gelatine, Acid (citric acid), Flavouring, Fruit and Plant concentrates (safflower, spirulina, apple, elderberry, blackcurrant, orange, kiwi, lemon, mango, passion fruit, aronia, grape), Caramelised Sugar Syrup, Elderberry Extract, Glazing Agents (beeswax, carnauba wax).